Rep. Andre Jacque (R-De Pere) is putting the finishing touches on a bill that would remove woodchucks from Wisconsin’s protected species list and allow people to kill an unlimited number of woodchucks during a season that would run nearly year-round. 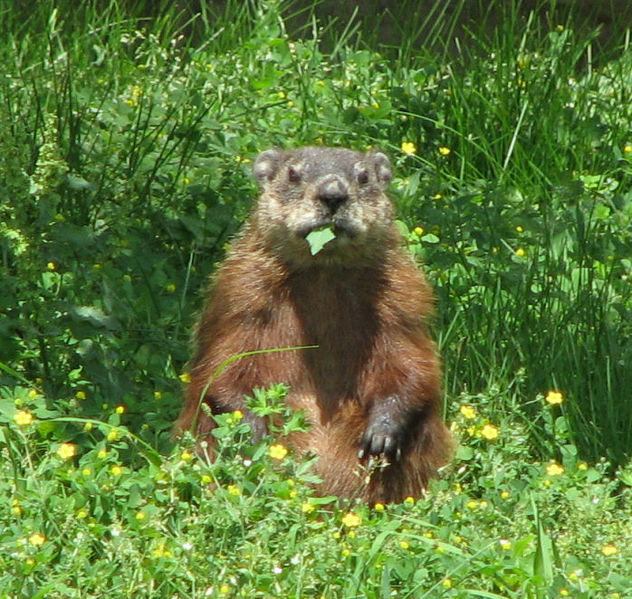 Jacque said woodchucks don’t serve protected status because they’re abundant and a nuisance. Jacque hasn’t formally introduced the bill, but he already has bipartisan support. Sen. Kathleen Vinehout, a Democrat who lives on a farm in Alma, has signed on as a co-sponsor. Considering that citizens in this state get off on blowing away the state symbol of peace, the mourning dove, it shouldn’t come as a shock to expect them to take mercy on groundhogs. What have we become as a state? For that matter what have we become as a species? Good job Wisconsin! Keep showing the rest of the country that we really are the most brutal and sadistic state in the country. Be proud! We must keep exposing these inhumane acts. I will keep posting and informing those that are reachable, and, well, those that are not reachable! What are these people smoking they seem to be few boards short to build a outhouse! I would prefer to have woodchucks as my neighbor than those assholes.Woodhucks are a lot more intelligent and they show more respect.They should stop thinking of ways to kill the animals and start watching them they could teach these morons.I wish on the ballot when we go to vote about what we want to happen with wildlife and stop these assholes. Our woodchucks were here when we built our house 34 years ago and we still enjoy watching them even when they eat my geraniums. Börjar tro att Wisconsin består allt mer av inavel – bland människorna!! My husband & I have written probably about 10 letters to Kathleen Vinehout in the past couple of years mostly concerning wolves, hunting & trapping issues. We try to write intelligent, articulate, knowledge based letters in a civil manner & have yet to receive 1 response. I’m not surprised she plans to co-sponser this bill. I never understand how people who are country dwellers can watch nature & instead of revelling in the beauty of a ambling woodchuck to want to kill it instead. People don’t seem to even try any logical abatement measures like fencing or making food sources less readily available, so as to not kill animals they regard as nuisances. We live in the country; are involved in agriculture & feel sharing with nature is a small price to pay for the joy we get back from observing them. With the exception of Fred Risser and a couple of other democrats the rest are no better than Suder. This is really the kill everything state and it is shameful. No wonder this is the home of Ed Gein and Jeffery Dahmer. They fit right in. Thank you for your comment Diane. I totally agree with you regarding your views on nature, and don’t understand why it seems so impossible for us all to co-exist with all wildlife. There is an intense war against wolves in my country too and Wolf Army Sweden and all of us advocating to increase wolf protection are banging our heads against federal agencies and hunters and livestock farmers who don’t seem to budge an inch. Sweden has set a “roof” number on the wolfpopulation here and it states that no more than 180-200 individual wolves are allowed to live here. At the same time we have vast natural resources scarcely populated by humans at our disposal and as a country we can maintain well over 200 wolves. It’s an endless war where the wolves are the victims and so very unnecessary. For me personally the wolf is a beutiful animal, I wish I could make others see what I see. Kathleen Vinehout is a piece of work. She came to Monroe with others for a campaign program concerning the primary for governor. She’s a big wolf hater too. I got into it with one of her pals who traveled with her. Vinehout is a dairy farmer. Glad she didn’t get far in the race for governor. That is the problem with this state. With exception of a few legislators like Fred Risser the rest are just as bad as the republicans when it comes to wildlife. We had a woodchuck in the little woods behind our house once. Our springer spaniel chased it around because she wanted to be friends with it. After running a little ways it literally threw itself on its back, panting and looked at her as if to say, “I surrender, please don’t hurt me.” She stopped and looked back at it all happy and friendly. It was all so cute! Woodchucks bring out the killer in people though. I’ve seen peace loving guys take up arms against them and I’m not sure why exactly. It seems they get in people’s gardens and eat a few things maybe? Every year I plant a couple of tomato plants and chipmunks invariably eat the tomatoes before I can. So, I buy some at the farmers market. Frustrating, but it doesn’t make me want to kill them. It’s funny how people automatically assume wild animals are the guilty culprits. We have to stop these idiots.